The Queen's extensive post-Coronation tour of 1953-54 yielded several jewels for her collection. The South Australian government wanted to present their new Queen with a stone their region was known for, the opal, and set about finding the best example around. 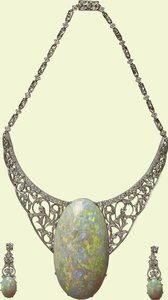 The chosen gem came from the Andamooka Opal Fields and had been found in 1949. Known simply as the Andamooka Opal, it is thought to be the finest opal ever discovered there and is praised both for the intensity of its colors and for its overall size. The cutting and polishing was completed by John Altmaan, and the final stone weighs a whopping 203 carats. 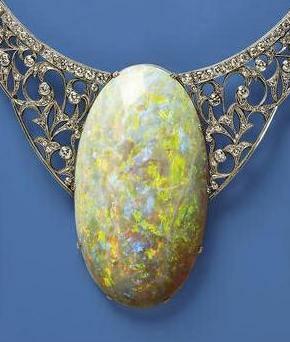 Adelaide company Wendts Limited set it into an ornate scrolled necklace made of diamonds set in 18 carat palladium and created a pair of matching earrings, each with an opal pendant. 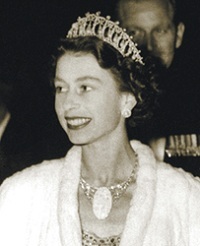 The demi-parure was presented to the Queen in Adelaide in March 1954 on behalf of the people of South Australia. The Queen gave the necklace a courtesy outing, if you will, during the same trip, but it seems to have been retired to the vault after that. The jewels she wears on a regular basis don't indicate any particular love on her part for opal, so the fact that she neglects to use this set isn't a huge surprise. But that said - I personally love a statement necklace, and I'd love to see someone new give this one a go.